“Opportunities and challenges. Women are underrepresented in science, technology, engineering, and mathematics (STEM) sectors anticipating jobs growth, where technological change can be complementary to human skills. There are some bright spots: job growth in traditionally female-dominated sectors, such as education and health services, will likely expand. The ongoing digital transformation is also likely to confer greater flexibility in work, benefitting women. But, breaking the “glass-ceiling” will be critical. Across sectors and occupations, underrepresentation of women in professional and managerial positions places them at high risk of displacement by technology. Crucial role for policy. Fostering gender equality and gender empowerment in the changing landscape of work remains an imperative across countries. Endowing women with the requisite skills. Early investment in women in STEM fields, along with peer mentoring, can help break down gender stereotypes and increase retention. Fiscal instruments for those already in the workforce (e.g., tax deductions for training, portable individual learning accounts) can remove barriers to lifelong learning. Closing gender gaps in leadership positions. Family-friendly policies can play an important role in boosting women’s retention and career progression, but setting relevant recruitment and retention targets for organizations, promotion quotas, as well as mentorship and training programs to promote female talent into managerial positions should be considered. Bridging the digital divide. 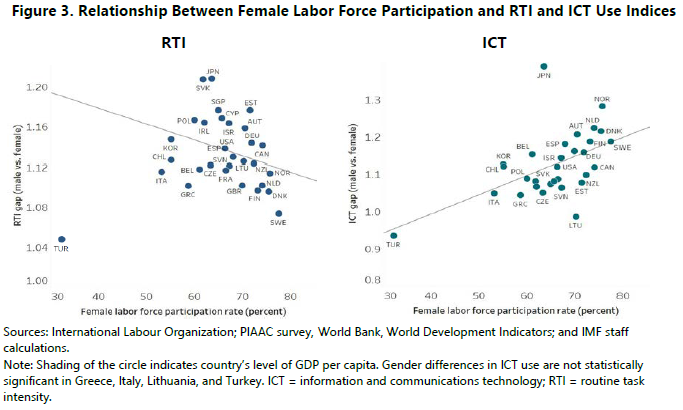 When it comes to the use of new technologies and access to them, countries must close gender gaps to improve women’s labor market prospects in the new world of work. Governments have a role to play through public investment in capital infrastructure and ensuring equal access to finance and connectivity.